Glamping: This ain’t camping, Grandpa. OK, so that’s not the official motto of glamping, but it may as well be. 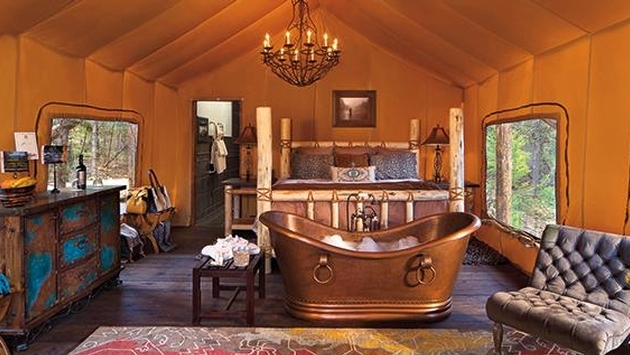 Glamping has redefined camping over the last decade, only recently becoming a buzzworthy trend. The notion is simple—camp in the great outdoors while not sacrificing luxury. Luxurious abodes pamper guests while the beautiful natural sites on this planet surround them. And, naturally, this has made dads very happy; for the first time ever, moms are actually enjoying sleeping in tents, because they aren’t really tents at all anymore. Late to the glamping bandwagon? Not to worry. TravelPulse will get you up to speed. Here are the five coolest things about glamping. Yeah, glamping is a real drag. Glamping combines the great outdoors with luxury. The woodsmen of the family can now wake up in the morning and go chop down a tree while the pampered/late morning risers can soak in their in-room hot tubs, cook up breakfast in their favorite kitchen of all time or nestle up to the wood burning stove (obviously, the woodsmen accounted for this already, providing ample logs acquired at night via the light of the moon). Glamping may not be something Ron Swanson of “Parks and Recreation” would approve of, but for those who aren’t strict traditionalists it offers the best of both worlds. The great thing about camping in luxury/glamping is that you still have the wonderful natural sites of this planet beckoning you from your crystal-lined doorway. That includes sites spanning from Montana to India to Argentina to Portugal to Italy to California. Whether you are seeking the mountains of Yosemite, the glaciers of Patagonia or the rivers of Cambodia, it’s all at your disposal, complete with designated glamping spots. Now you can experience the sights and smells of the great outdoors while (literally) bathing in luxury. Note: See below video of The Resort at Paws Up in Montana. If you don’t break down and cry, you aren’t a real American. Glamping, of course, includes all the fine accommodations and amenities you come to expect from luxury resorts. Areias de Seixo in Portugal, for example, features Jacuzzis, fireplaces, rainfall showers, comfortable beds and accompanying terraces…all surrounded by a wonderland complete with pine trees, dunes and sea. Four Seasons Tented Camp Golden Triangle in Thailand features custom-made tubs and outdoor decks, rain showers, private bars and luxurious furnishings…all complemented by heating, air conditioning and high-speed Wi-Fi. Heck, even Wagonstays Luxury Escape in New Zealand (yes, you stay in a covered wagon) has a fancy studio-style kitchen, a full bathroom with hot water, heat and air conditioning and a TV with DVD and CD players. Tree tents are awesome. They are the kind of things that turn grown men into kids again, and they’ve become synonymous with glamping. Except, glamping tree tents are different things all together. Red Kite Tree Tent in Wales, for example, is made from hybrid aluminum and a static airframe. It features a royal purple-decorated interior, plush seating, a wood burning stove, a comfortable double bed, wool and cotton thermal lining, power, and enough electricity to charge your cell phone. Of course, there is plenty of unique architecture and design elements beyond tree tents. Entre Cielos in Argentina is an oval-shaped cylinder, Remota in Chile has a minimalistic design based on straight lines and light, and La Pinta du Vieux Manoir in Switzerland, well, it just features a golden-coated tree house complete with floor-to-ceiling glass windows offering 360-degree panoramic views of Lake Murten. When you go glamping, you are celebrated for being artsy. If glamping seems like a weird fusion of styles, well, it’s because it is. I decided to search for glamping photos on Twitter for fun to see what types of people go glamping. Here are some photos that popped up. Yep, that about covers the glamping demographic…. Heck, even the Queen is going glamping! You go, Queen!